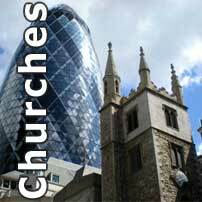 St Clement Danes is on the Strand, a short way west of Temple Church, and outside the Royal Courts of Justice. The first church on the site was reputedly founded by Danes living nearby in the ninth century. The location, on the river between the City of London and Lundenwic (future Westminster), was home to many Danes at a time when half of England was Danish. Being a seafaring race, the Danes named the church after St Clement, patron saint of mariners. The church was first rebuilt by William I, and then again in the Plantagenet period. It was in such a bad state by 1680 that it was demolished and again rebuilt by 1682 by Christopher Wren. 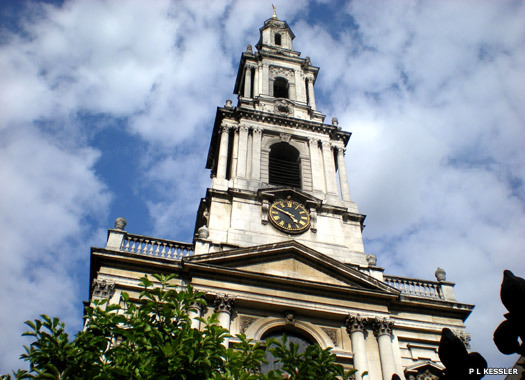 The steeple was added to the 35 metre (115 feet) tower in 1719-1720 by James Gibbs. The church was almost destroyed during the Blitz on 10 May 1941. The outer walls, the tower and Gibbs's steeple, survived, but the interior was gutted by fire. Rebuilding was completed by the RAF in 1958. 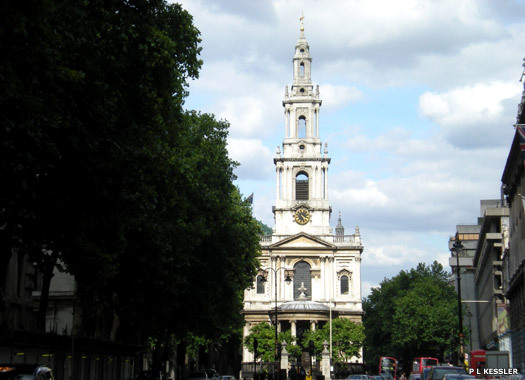 The Parish Church of St Mary-le-Strand occupies the centre of the Strand, close to the Postland Road junction. It existed in 1147, a short distance to the south, and by 1222 it was known as the Church of the Innocents, or St Mary and the Innocents. This church was pulled down in 1549 by Edward Seymour, first duke of Somerset, to make way for Somerset House. The parishioners were promised a new church which was never built, forcing them to move to the Savoy Chapel. The current site was formerly occupied by a great maypole which had been the scene of May Day festivities in the 1500s and 1600s but was severely decayed by the early 1700s. Construction of the church began in February 1714 under the architect James Gibbs. 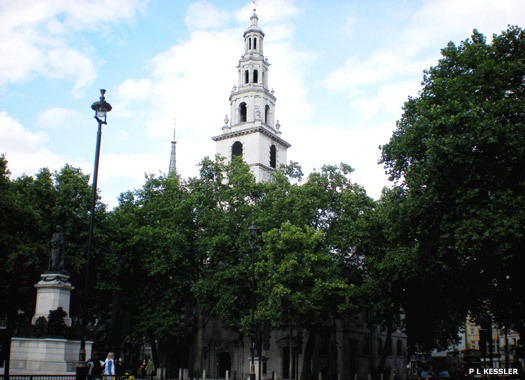 The steeple was completed in September 1717, but the church was not consecrated for use until 1 January 1723, and narrowly escaped destruction at the start of the twentieth century when the Strand was widened. 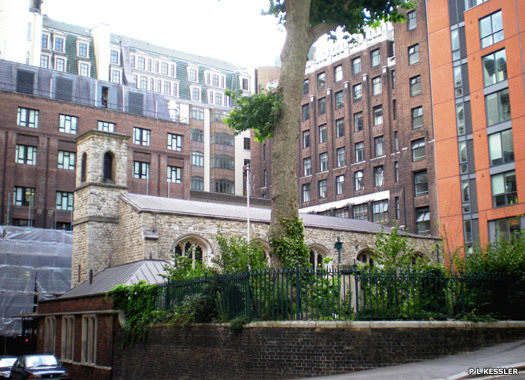 Enon Chapel formerly existed on St Clement's Lane, now on the north side of the Royal Courts of Justice. 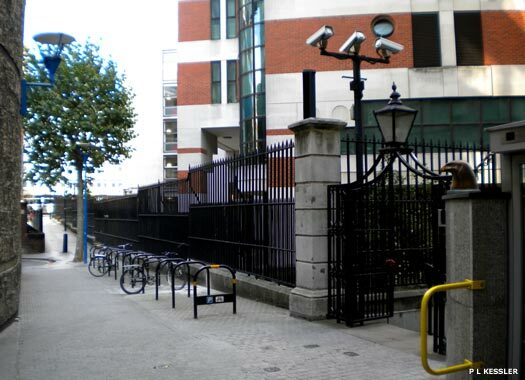 The building stood close to the eastern entrance to Clement's Inn, and the access to it was through a gateway leading into a narrow and extremely dingy court, which opened out into Carey Street. It was converted from secular to religious use in 1823 by a Dissenting congregation. 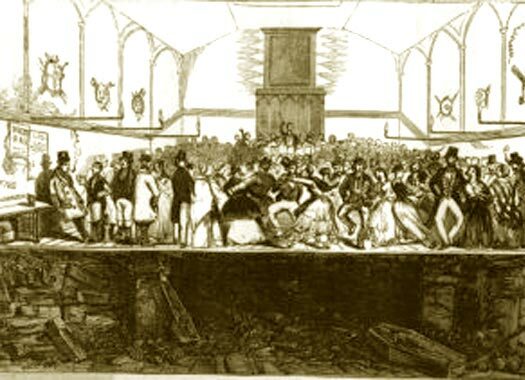 The main floor was used for services, while the large sub-floor level was used to bury the dead. The basement filled up with coffins thanks to a corrupt Congregational minister. The scandal was uncovered in 1844 when a new sewer was laid. The chapel was closed but the bodies left to rot. The main hall was tenanted by teetotallers who turned it into a dancing-room ('Dancing on the Dead', pictured). A surgeon took over the chapel in 1848 and removed most bodies to Norwood Cemetery. 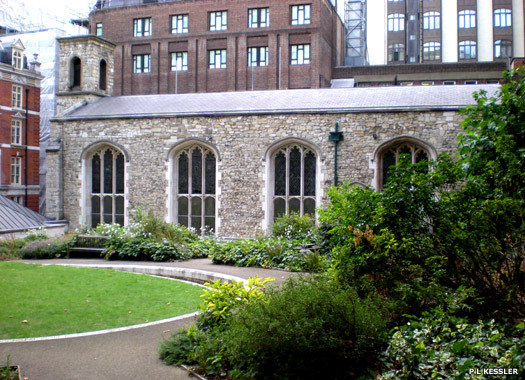 The building was then converted into a chapel of ease called Clare Market Chapel. St John the Evangelist Drury Lane is on the western side of the street. The first place of worship opened here, in 1838, was known as Tavistock Chapel. It may have been an Anglican mission, but this cannot be confirmed. 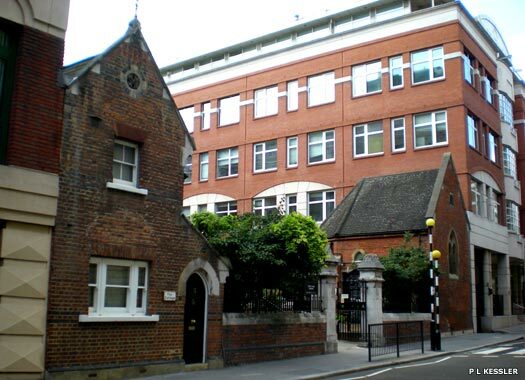 In 1858 a new church was opened on the site to cater for the burgeoning population of the Covent Garden district, and this gained its own parish in the same year. The church was closed down in 1938 and the parish united to Holy Trinity Kingsway. Crown Court Scottish National Church is nestled in amongst the theatres of Covent Garden, immediately west of St John's. 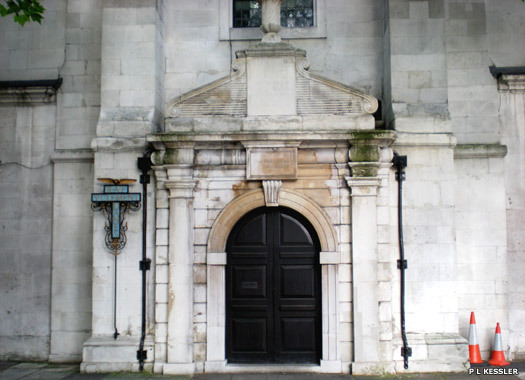 The church is the Presbyterian representative of the Scottish Church in London and was the first of its kind established south of the border in 1711, just four years after the Act of Union between England and Scotland, although Whitehall Palace Chapel was probably used unofficially from 1603 by the court of James I of England. 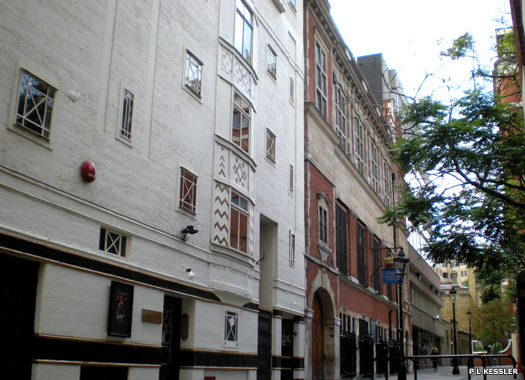 The Queen's Chapel of the Savoy lies alongside Savoy Street, immediately east of the Savoy Hotel. It is a 'free' chapel, not falling within the jurisdiction of a diocesan bishop. Henry II gave an area of land here in 1246 to Count Peter of Savoy, from whom it gained its name, and later it was reacquired by Henry III's widow. In the 1360s, John of Gaunt, duke of Lancaster built the splendid Savoy Palace which was destroyed by Wat Tyler's Peasants' Revolt of 1381. In 1399, Henry IV declared the duchy of Lancaster (and the Savoy lands) to be a personal possession of the monarch, and by tradition the reigning monarch also remains the duke of Lancaster. Henry VII built a great hospital here for the poor and needy. Finished in 1512 it had three chapels, of which the Chapel of St John the Baptist here is the only survivor. The famous Savoy Conference on the Book of Common Prayer also took place here in 1661.